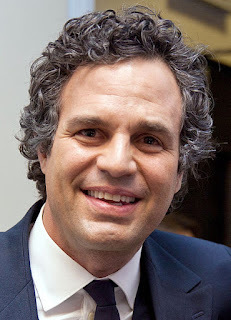 Actor Mark Ruffalo suffered from a left acoustic neuroma that required surgical removal in 2001. The surgery left him with a temporary left facial paralysis that took almost one year to resolve causing him to "disappear" from acting for that period of time. Along with his temporary facial paralysis, he also unfortunately permanently lost his left ear hearing. It was only recently that he came forward to fully explain what happened in 2001 given his sudden disappearance from the acting world. Speculation about his disappearance included drugs, cancer, AIDS, etc. At that time to quell rumors, he ultimately released a statement that a "minor cyst was removed from his inner ear successfully." An acoustic neuroma is a benign tumor of the hearing nerve. Initial symptoms of such tumors include slowly progressive asymmetric hearing loss in the affected ear's hearing. Asymmetric tinnitus or ringing of the ear may also be present. Typically, such patients present to an ENT office with these complaints. An examination of the ear is normal. But a hearing test obtained will show an asymmetric sensorineural hearing loss. 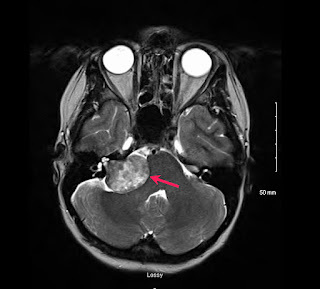 With such a finding, an MRI scan of the ear region is subsequently obtained which diagnoses this abnormal tumor (see image below; red arrow). With options #1 or 2, risks include facial paralysis and permanent hearing loss mainly because the tumor involves the very nerve that allows a person to hear. The reason why facial paralysis is also at risk is because the facial nerve is literally next to the hearing nerve as both nerves enter through the skull. Option #3, watchful monitoring via serial MRI scans on a yearly basis is possible because these tumors grow VERY slowly and is NOT cancer. Average growth is about 1mm per year. The only downside with doing nothing is that as the tumor grows, the hearing typically gets worse and eventually, facial paralysis may occur. Pursuing surgery or radiation when the tumor is much larger also increases the risk of hearing loss and facial paralysis after treatment. In the case of Mark Ruffalo, the acoustic neuroma was the size of a walnut. Surgical removal which took 10 hours caused a facial paralysis that required one year to fully return back to normal. It took about 6 months before some movement returned to his left face. His left ear hearing, as already mentioned, was permanently damaged. Watch a video with Mark Ruffalo explaining his experiences.